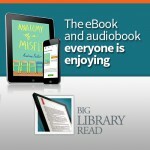 The Hudson Area Library is participating in the 10th annual Big Library Read, the world’s largest digital Book club through public libraries that connects millions of readers around the world with the same eBook at the same time. For a two-week period beginning June 23, Hudson Area Library users will be able to borrow the eBook, A Murder in Time by Julie McElwain (Pegasus Books), from http://mhls.lib.overdrive.com and participate in a worldwide version of a local book club. There will be no waitlists for this popular mystery with a twist. Big Library Read is facilitated by OverDrive, the leading platform for eBooks and audiobooks from the library. Big Library Read is a free program. To get started reading, all that is needed is a Hudson Area Library card. A Murder in Time can be read on all major computers and devices, including iPhone®, iPad®, Android™ phones and tablets, Chromebook™ and Kindle®. The eBook will be available with no wait lists and will automatically expire at the end of the lending period, so there are never any late fees. There’s only one thing better than a good e-book…not having to wait to download a copy! From February 17th to March 5th, there will be unlimited copies of Keys to the Kitchen: The Essential Reference for Becoming a More Accomplished, Adventurous Cook by Aida Mollenkamp from Overdrive, the Mid Hudson Library System’s Digital Downloads site- no holds, no wait-lists! The Big Library Read is a global movement of all those who support the availability of e-books through libraries. Show your support for e-books by borrowing a copy starting on the 17th!